I've probably seen this one as much as I've seen the first movie. I do think the movie works very well. 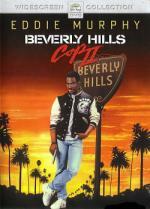 The plot is interesting, and things are set up in a way that makes for Axel to go back to Beverly Hills. It is established within the first few minutes that Axel has remained in touch with Bogomil, Rosewood and Taggart. There isn't a lot of mystery, though it is still interesting and entertaining. The plot is somewhat simple, though there are still a few minor surprises. There is a decent amount of humor like there was in the first one. Again, much of it is provided by Axel and the things he says and does. Axel is a very entertaining character and I do like him. Rosewood shows a bit of a different side with a few violent tendencies coming out in interesting ways. Some of what happens is a bit silly, but it works for what is going on. There are shootings and chases and even an explosion or two. The action does help to keep things interesting. The violence isn't that graphic for the most part, though one or two things are slightly more graphic. There is a lot of swearing again. The characters are likable overall and I like the cast in the parts. There are some extras on the DVD, but I haven't checked them out yet. The movie is wonderfully entertaining. I do think it is one of the better sequels made and it is definitely worth watching.